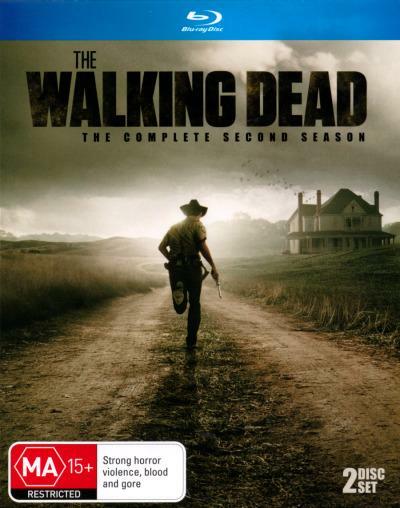 The Walking Deas the Complete Second Season Blu-ray Review. The Walking Dead: The Complete Second Season is a fitting continuation from the first, with some great character development, big shocks, heaps of Walkers, enough action and as always; heaps of blood and guts! You’d be silly not to come back for this season, or start from the first, because it’s just getting better and better! After failing to find answers at the Centre of Disease Control, Rick (Andrew Lincoln) and his group head out onto the road again, deciding that Fort Benning would be their next best hope. When they reach an impassable maze of abandoned vehicles on the highway, they stop to search for supplies while they work out another way to make it to the Fort. While there, a large herd of Walkers move through maze and some of the group are scattered through the woods. During the search for their missing people, an accident occurs in the woods, which leads Rick and the other to the farm of Hershel Greene (Scott Wilson) and his family, who take them in. Feeling they may now have a place where they can be safe, the idea of staying on the farm permanently is a godsend for the group, but unbeknown to them, Hershel and his family are harbouring their own dark secrets on the farm. The Walking Dead is back with Season 2 of this critically acclaimed show and it’s back with a bang! The show is still on top form taking the characters and the drama forward in leaps and bounds. Looking back on the first 6 episode season compared to this, which is a very robust 13 episodes, it’s like the first was just a taste, an appetizer if you will to a much juicier (no pun intended) and meatier (okay, maybe that was a little intended) feast to come, which is what we have here before us. Not saying that the show is without it faults. A number of people complained that they spend too much time hanging around the farm and not a great deal of zombie-munching action. While this is half true, the earlier episodes of the season trade action for deep and heavy character development, but hey, that’s TV! A show’s gotta grow! There’s no point in dolling out action, action and more action if the characters involved are one dimensional and we really don’t care about them at all! All characters are given room to breathe and grow including Rick, Lori (Sarah Wayne Callies), Andrea (Laurie Holden),Glenn (Steven Yeun) and Daryl (Norman Reedus), who is moved from supporting character and into the main cast and he comes along way this season. But the one character who is really the standout of this season (and was my personal favourite to watch) is Shane (Jon Bernthal). Here he really gets to stretch his legs as an actor and show a great deal of depth to a well written and unpredictable character, who I found to be the most interesting of the season. Fans of the show were given pause to worry when the series executive producer and show runner; Frank Darabont, decided to step down from those roles behind the scenes. Now this made we, the fans, a little skitchy. Why did he leave? What does this mean for the show? Are we still going to get the cinematic quality of episodes previous? It was Darabont’s vision and love for the source material that really drove the first season and made it a hit! Reasons for his departure were released as him stating that he was having trouble adjusting to the schedule of running a television series. Later, The Hollywood Reporter broke a story revealing that Darabont had been fired from the series due to issues with the show’s reduced budget and his strained relationships with AMC executives. But these are neither here nor there. What we want to know is if the show still works and has that same spark and glad to say, it sure as hell does! Series writer and executive producer Glenn Mazzara was appointed the new show runner, with previous credits, including executive producing hit series The Shield. With Mazzara really starting to make his mark with the second half of the season, it’s a little jumpy here and there at first, but by episode 8, the wheels really start to turn and we begin to pick up the pace to the finale. The second half of the season starts to have the feel of a television series and less like Darabont’s mini-movie episodes, but don’t worry, this isn’t a bad thing, because the pace is cracking! It’s still the same show at heart and handled by the same team, but the feel and pace begins to speed up and that’s really what we like to see, after all, these people are on the run from flesh-eating monsters! We really are treated to some great stuff this season, with at least 9 big shockers and reveals across the 13 episodes, some which made my jaw drop and others making me excited for what’s to come and with the final episode ‘Beside the Dying Fire’, fans who have read or know of the original material, will be grinning from ear to ear with what goes on in this episode and have the salivating and chomping at the bit for the release of Season 3, which will get bigger and a whole lot more dangerous. When I reviewed the first season of The Walking Dead (on DVD), I commented on the pictures transfer. How poor the quality of the image was and the amount of digital noise present on the image. It’s a shame to say that, again, the picture quality isn’t great and this is a Blu-ray release (I can just imagine what the DVD release looks like..)! Unfortunately the quality varies, at times (I found with interiors), the picture is fantastic. Not 100% perfect, but fantastic. Others, including exteriors, are riddled with digital noise! It really is a shame, but the quality of the picture varies! It’s up and down like a yoyo, which makes it really hard to pin a score on the image, but I’ve settled on a number, which is listed above in the scores. The Walking Dead: The Complete Second Season is a fitting continuation from the first, with some great character development, big shocks, heaps of Walkers, enough action and as always; heaps of blood and guts! You’d be silly not to come back for this season, or start from the first, because it’s just getting better and better!